Approximately 18" (23) / 46 (58.5) cm circumference and 7" / 18 cm tall. 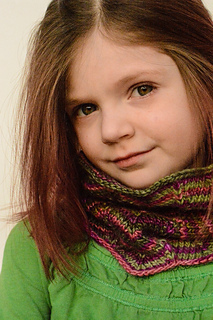 Sammy scarf & Rex cowl are sold as a set. 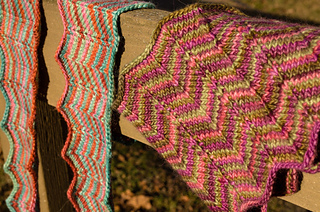 A scarf and cowl featuring a striped chevron pattern that makes the most of Moonshine Trios’ color changes. 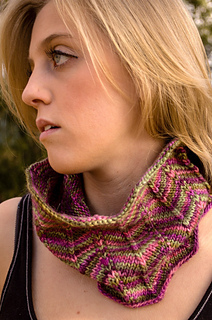 Cowl Sizes S (L): Approximately 18” (23) / 46 (58.5) cm circumference and 7” / 18 cm tall. 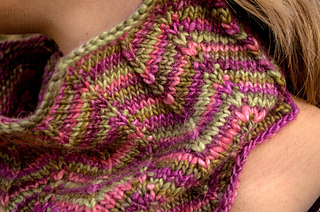 Choose two colors of Moonshine Trios from the list of combinations below. Label one C1 and the other C2.